I’ve never worn bangs (or if I have, I’ve long forgotten), but these ladies make me want to give bangs a second thought. Some women were born for bangs. Like Mandana Dayani, Vice President of Rachel Zoe, Inc. (top left) or actress/musician Zooey Deschanel (bottom middle). I had to resist the urge to post 79 images of these women because, every way they rock ‘em, their bangs work. When Rachel Zoe decided to bang it, a hold your breath moment that she shared with us on her reality show, I wasn’t sure she was making the right choice. She has won me over since. Her new looks lends her a haute hippie-rocker chick, Marianne Faithful vibe that freshened her look, while hewing to her trademark modern-vintage hippie style. In cutting bangs into her dignified bob, First Lady Michelle Obama did more than just freshen her looks, she demonstrated, yet again, that the first lady is first of all a woman and not a role. She’s been an individual, perhaps more than any first lady in history, wearing fresh young designers, mixing the high and the low and, yes, cutting her hair into bangs because she was turning 50 and needed a change. It was a very modern, not to mention very flattering move. Faux Washington power broker Kerry Washington (a.k.a. 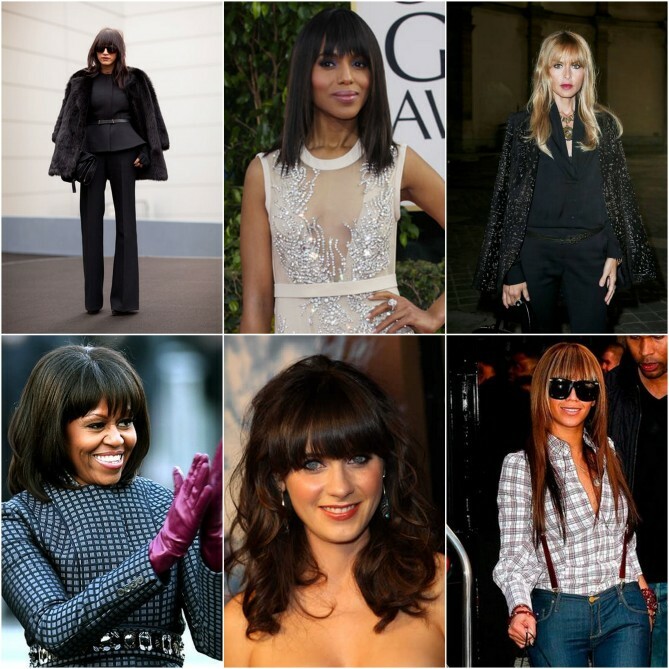 Olivia Pope) is also rocking the bangs of late and Beyoncé, who looks good every which way, also tried bangs on for size. I can’t get over how down right pretty bangs make these ladies look, whether they’re wearing them with edgier, blown-straight hair or soft, gentler waves. Still not sure they’re for me, but I’d definitely love to find out.